uite a bit of ink (both literal and electronic) has been spilled these last few days regarding Pope Francis’ most recent interview. I have almost nothing to add to any of it, since if you read Francis’ words, in context, in their entirety, I think he’s pretty clear about what he’s trying to say. Francis recognizes that the Postmodern world doesn’t know Jesus at all, and he wants to do something about that. He wants the Church to be, first and foremost, a group of ambassadors for Christ, to go into the world and proclaim the Gospel (sound familiar?). To that end, he comes across as critical of serious liturgy and the “culture wars.” I think it is because Francis wants us to get the basics right first, and then move into a deeper focus. Beautiful liturgy is important to the Church. I wouldn’t do what I do for a living if I thought it wasn’t. Liturgy and morality, however, come out of an already existing relationship with Jesus Christ. Without this prior relationship, liturgy is just an act, and morality is just a sham (an edifice that will fall like a house of cards, in Francis’ words). Our first encounter with Christ must be like that of a child before building to a more mature, moral and liturgical faith. When I was very young, my family used to vacation to Lavallette, New Jersey, every summer. We would rent a house for a week or so and spend almost every day at the beach, interspersed with taking in Little League games or walking the boardwalk. To this day, when I think of the word vacation, those are the images that come to mind. One year, when I was perhaps 3 years old or so, we went to Lavallette, taking my cousin and his girlfriend along for the trip. 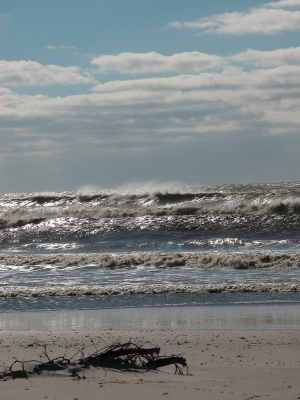 The ocean on one particular day was heavily affected by a nearby storm, and the waves were strong and dangerous. The red flags were out at the beach: no swimming allowed. Not wanting to waste a day, our family stayed anyway, lounging on the beach and making an enormous sandcastle with my teenage cousin. It was much taller than I was at the time, and it had a sweet moat and even a couple of full sized thrones. I ran down to fill my favorite red bucket with water for the (sweet) moat, the vicious undertow snatched it out of my hands. Before I could recover it, the bucket was swept out into the ocean. The strong surf prevented any attempts to recover it, and I was crushed. I wept like, well, a 3 year-old and was positively inconsolable. There was nothing anyone could do. My mother, just trying to calm me down, told me I should pray about it. I did. I paced around the blanket for 5 or 10 minutes with my eyes closed and my hands clenched in prayer. I don’t really remember what I was thinking or saying, but I remember my posture. Suddenly, a massive wave rose off in the distance, caught up the bucket (which was at least a hundred yards out by this point) and swept down on us. The wave crashed far past where any of the others had, traveling all the way to the back fence and the dunes. It flattened our umbrella, ruined the radio, soaked everyone present, and leveled the sandcastle (leaving my cousin hilariously up to his waist in sand). It hit no other blanket on the beach, only ours, but I got the bucket back. Supernatural? Probably not. I am one that believes that most miracles have less to do with substance and more to do with the who, what, and when they occur. The timing is indisputably precise on this one. It didn’t save lives. In fact, it seems like a pretty trivial event for divine intervention. When I think of it, though, almost all of my problems seem pretty trivial, but I pray anyway. I think Francis’ aim to point people to a relationship with Christ is timely and powerful. If we turn to Him as children do, the Church and the world will face a renewal that we truly need. They just might do it.